Looking after our teeth is something that is drummed into many of us at an early age and a daily brushing and flossing routine goes a long way towards helping us to maintain healthy teeth and gums. However, for some patients it doesn’t matter how hard they try to look after their smile, they still develop dental problems. Decay, damage as a result of decay and gum disease can all pose a serious risk to the health of your teeth. While dental treatments have evolved hugely over the last decade, unfortunately there are still occasions where single or multiple teeth are unable to be saved. Whatever the reason for loosing teeth, it can have a profound effect on our lives. The physical effect of tooth loss will largely depend on how many teeth have been lost, and what part of the mouth they have been lost from. This is because missing teeth can affect the functions of your mouth you usually take for granted such as biting or chewing. It can also impact the way that you speak. Tooth loss can also have a substantial psychological impact. Gaps in your teeth can affect your confidence, and your willingness to smile, laugh and even talk. What are the options for treating tooth loss? In the past, dentures and dental bridges have been the only viable options to restore both the function and appearance of teeth. However, innovations in the field of dentistry have continued, leading to the creation of dental implants, which are now the premier choice of patients who have suffered from tooth loss. One of the biggest reasons that patients are moving away from dental bridges and dentures is because of the limitations and disadvantages associated with these types of tooth replacement. Heavy preparation. In order to make space for the bridge, the teeth must be filed down significantly. Damage to nerves. When teeth are prepared for the crowns that make up the dental bridge, there is often a lot of damage to the nerves that mean that root canal treatment is likely to be needed in the future. Difficulty to clean and care. Extra-special care is needed to keep the underside of the bridge clean and free from bacteria. A long time in the chair. The appointment to get a dental bridge is extensive, and you can expect your first appointment to take anything up to three hours. Your follow-up appointment should then take around an hour. Unsuitable for multiple missing teeth in different areas of your mouth. Removable. While they can be removed for cleaning, dentures rely on an adhesive paste to stay in place. This isn’t always reliable, meaning they can slip and rub against your mouth, which can be uncomfortable, not to mention embarrassing. High maintenance. Dentures need to be thoroughly cleaned every time that you wear them and stored overnight in water. Replacement. Dentures don’t last forever and they will need to be replaced when they wear out. Limitations on eating, drinking and speaking. Many patients with dentures are unable to eat chewy or tough foods because they are concerned about their dentures slipping. They also find that they adjust the way in which they eat other foods, drink and speak to prevent the dentures from coming loose and being noticeable. Permanent. 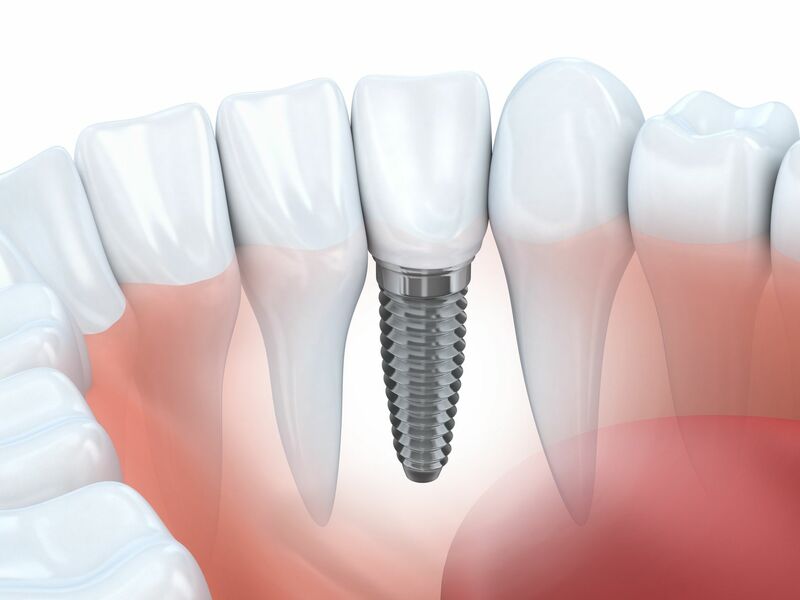 Dental implants are secured in your mouth using a titanium post which integrates with your jawbone. This makes them the strongest and most durable tooth loss solution available. Discreet. The permanency of dental implants, plus the fact that they can be color-matched, makes them extremely discreet. Restorative. They can also help you to return full function to your teeth, with no limitations on what you can eat or drink. You can also speak, cough, sneeze, laugh and kiss without worrying about your teeth. Preservative. The metal posts inserted into your jaw bone actually help to support it and prevent gum and bone deterioration. Root removal. When a dental implant is placed, the titanium post takes the place of the root, removing the risk of later root-based infections. Successful. Dental implants have the highest success rate of any surgically implanted device of around 98%. This is partly because the posts used are created from titanium which is a bio-compatible material. No effect on surrounding teeth. Although implants require some preparation in that it is necessary to wait for the post to integrate with the bone before the final crown is fitted, there is absolutely no need to touch any of the surrounding teeth. Long-lasting. Unlike dentures, dental implants do not ‘wear out’ and if they are well looked after, they can last upwards of twenty-five years! Do you currently have dentures or a dental bridge that you aren’t fully satisfied with? Are you facing imminent tooth loss and are looking for a solution to restore your smile? Contact your dentist for further information and to arrange a consultation to see if dental implants could be the right choice for your long-term dental health.